Whether you’re looking to rent or sell a house, or just to get it appraised, the appearance of the grounds of your house can have an often underappreciated effect on its value. And of all the greenery you might have on a property, the most all-encompassing is also the most all-covering: your grass. With proper maintenance you can have a lawn that’s green and level, not only turning your neighbors green with envy, but also putting more green in your pocket. Curb appeal is the cover to your book: people are going to judge you by it. When people look at your house, they aren’t just looking for the size and how many stories it is, they are also looking for indications on how well you maintain it. A lawn that has patches of brown or sickly green, that has dead spots or places where it’s growing knee-high, shows negligence. A brilliant green lawn with proper edging and trimming around trees lets people know you take good care of all your house, especially if held up to any Joneses next door who have not. In a survey by TruGreen polling homeowners, 79 percent of homeowners reported “having a healthy, green lawn contributes to the overall value of a home”; and 56 percent said “when buying a home, a good lawn would warrant a higher price.” When asked about how the quality of the lawn affect their opinion of a house, 53 percent of Americans said “the quality of the homeowner’s lawn can tell you a lot about the quality of the home overall.” Obviously there’s some truth to the thought of a lawn as the coalmine canary of the house. It is a rare breed that actually enjoys mowing the lawn, but there are many tools to make the job easier. 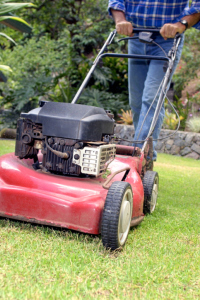 While there are many mowers on the market, you can accomplish great mowing with a push mower to a riding lawnmower: it’s all about the amount you need to cover and the types of terrain you have to work with. A weed eater or trimmer can be used to clean grass and weeds from around the house, trees, and shrubbery, and can also be turned sideways to perform edging for driveways and sidewalks. Speaking of getting an edge, sometimes you need more than water and sunlight to get your lawn brilliantly green. While there is the nuclear option of replacing the lawn, sometimes all it needs is a little food. Lawn feed provides fertilization along with nutrients to get the most out of each blade of grass, with options to also eliminate common grass weeds. Application can be pushcart or hand-cranked granules, or bottles you hook up to your garden hose to apply in a spray. Having a beautiful home is a lot of work that will always pay off, but you don’t have to go it alone. If you don’t want a garage cluttered with tools or grass stains on your knees, you have alternatives. At Greener Horizon, we can bring our knowledge and professional tools to any problem your lawn might have, and will help you get the most out of your house. If you’d like to know why the grass is always greener, please contact us with any questions or for a consultation.